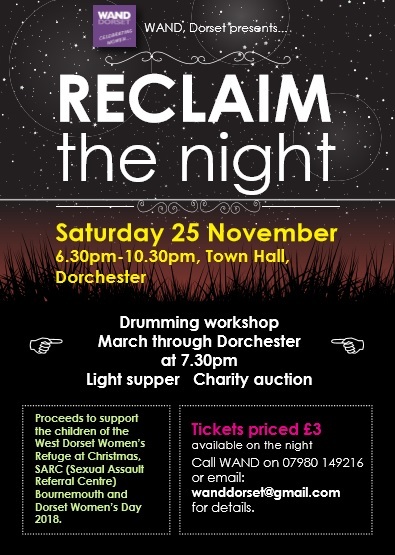 You are cordially invited to join us at this year's Reclaim the Night event on Saturday 25 November, from 6.30-10.30 (please note it's an earlier start than last year), at the Town Hall in Dorchester. Enjoy a fabulous event with a serious message. We’ll have a drumming workshop, a march through town (drumming), a delicious supper and a fun charity auction raising money for the West Dorset Women’s Refuge and The Shores (Sexual Abuse Referral Centre) in Bournemouth. "It's always a challenge to find the right words to talk about the Reclaim the Night in Dorchester. It is undoubtedly a very special night where united voices make a positive noise to say, 'Enough is enough' but I'd like not to have to write them at all. I'd love domestic violence to be a thing of the past, as would many other women in Dorset who are faced with a clear and present danger every day. I would be remiss if I didn't mention here that domestic violence also takes place to men and to the LGBTQ community too and that's equally abhorrent, but the statistics show that these crimes are predominantly carried out on women, and Reclaim the Night puts a spotlight on that fact. Domestic abuse isn't something that happens in other peoples neighbourhoods; it happens everywhere, it doesn't give a jot about your place on the social spectrum, your income or race. It commonly takes place under peoples noses and when you have a perpetrator who is seemingly charming to the rest of the world, it can take all of your bravery to step forward and contact the police in a bid to escape it; thank heavens that we still have a refuge. Referrals to the Dorset police continue to rise. In 2016, they were the highest they'd ever been, but so were prosecutions and convictions. They recorded 5,259 domestic abuse crimes, an approximate 10% increase on the previous year. From January to the end of April 2017, they've recorded 1,630 domestic abuse crimes. I have spoken with many women who have suffered the violent hand and/or vicious tongue of an abuser and I know that taking steps towards reporting a crime can be the most terrifying ones, but our police force now have specially trained officers dedicated to investigating domestic abuse offences and there's a dedicated team who support those at high-risk. Figures for the first quarter of 2016 showed that out of all UK police forces, Dorset achieved the highest domestic abuse conviction rate in magistrate courts, at 87%. We hope you can join us."